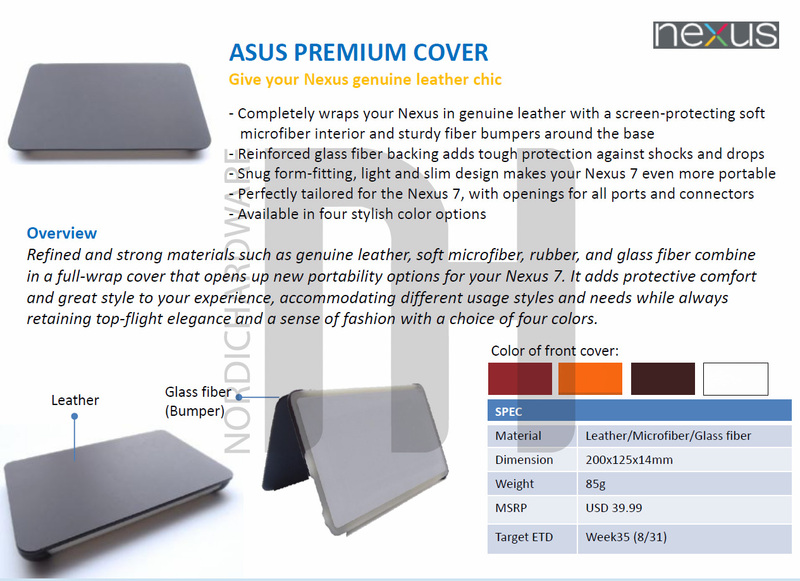 According to leaked slides obtained by Nordic Hardware, the Nexus 7 accessory lineup is about to get a lot more interesting. You know those pogo pins on the side of the device? Yeah, there is a dock on its way that will take advantage of them. These slides show a $49.99 price tag and an 8/24 release date. 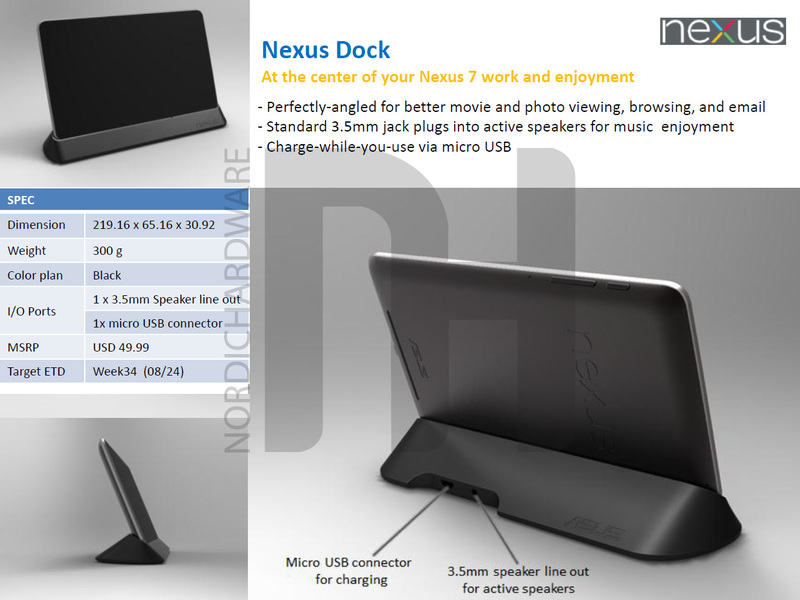 The dock has been made to “perfectly-angle” your Nexus 7 for “better movie and photo viewing, browsing, and email.” It includes a 3.5mm headphone jack, so that you can hook up speakers, however, it does not appear to have HDMI support. That shouldn’t surprise you, though. What about cases? Were you not satisfied with the TPU case that we took a look at earlier? No worries, because there is a premium leather version in the works as well, that should arrive around 8/31 for $39.99 in 4 different colors. 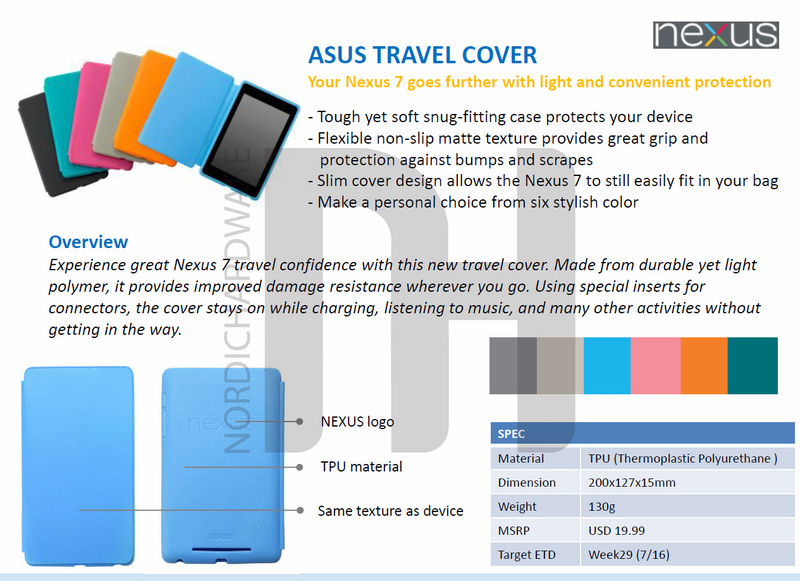 And if the TPU case was your thing, but you were simply waiting for Asus to release other colors, you should have them…well, we still aren’t sure even though they continue to pop up in plans. As of today, you can only purchase the dark version from the Google Play store. Assuming all of this is legit, this hopefully made your day as it has ours. Monday Poll: If Multiple OEMs Produce a Nexus Phone, Whose Would You Buy?